on the woodside. : *november challenge, day 7. This, my friends, is a truly "kitchen sink" sort of breakfast. Clearly I am of the opinion that when one sleeps in past the point of appropriateness even for your average college student, one deserves a portion size equal to breakfast and lunch jammed together. 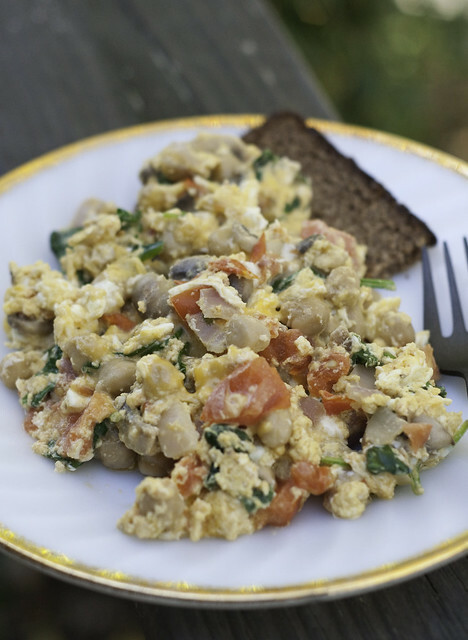 In sum, that's red onion, tomato, mushrooms, garbanzo beans, and spinach scrambled with Cheddar cheese, two eggs, and a squirt of Dijon mustard. Plus a slice of the rye bread I've discovered is 100 times more appetizing when toasted. I had ulterior motives, too, though, mainly that it is really pretty difficult to eat your fruits and veggies before they spoil when one lives alone and/or with a dog who has no appetite for healthful human food. So the faster I eat them the less waste I have, but it can also sometimes mean eating things you don't particularly want and/or in massive quantities, just to keep from tossing food in the garbage (which I loathe doing). It is a strange aspect of my personality that I like virtually all vegetables better raw than cooked—it gives me that singular crunch I'm always looking for. You know, the one I get from fried potatoes. But that might have to change; cooked veggies have the benefit of lasting longer in the refrigerator and freezing beautifully. Which leads me to last night's dinner, a cauliflower soup I found at Lucullian Delights. My photography is woefully lazy compared to the ones you'll see over there. This was the perfect excuse for me to buy myself an immersion blender, and OH MAN IS THAT FUN. I had to sub Brie in for the Taleggio, unfortunately, but I couldn't resist jazzing the whole thing up with some crispy prosciutto, black pepper, and chives. Leftovers came to work with me today for lunch, and I have aspirations of mixing some in to mashed potatoes, but the rest will go in the freezer, where it will sit and wait for the next cool, rainy day. 1. Heat oil in a stockpot over medium heat; add onions, and sauté until translucent. Stir in cauliflower and wine, and cook 1 minute. Stir in water and season with salt to taste. Bring to a boil; cover halfway with pan lid, reduce heat to medium-low, and simmer 20 minutes. 2. Remove pot from heat, and purée soup in a blender or with an immersion blender until smooth. Add sour cream and cheese, stirring until cheese melts. Taste and season with more salt, if necessary. Return pot to stove over low heat to keep warm. 3. In a small, dry skillet, toast prosciutto over medium heat until browned and crispy. 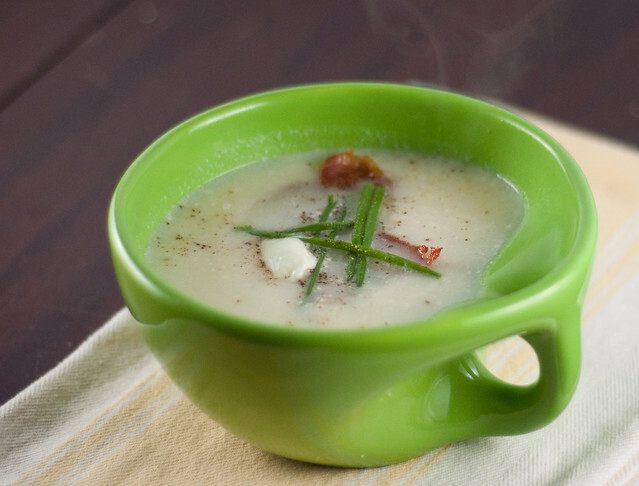 Divide soup among serving bowls and top with prosciutto, chives, and black pepper to taste. Makes 4 to 5 servings. Loving the posts (like I always do). Have you tried tossing cauliflower in olive oil, salt, and pepper and then baking in the oven? Super good. (I also add a little parmesan cheese but you didn't hear me say that). no, but i do this with broccoli! will have to try with cauliflower.